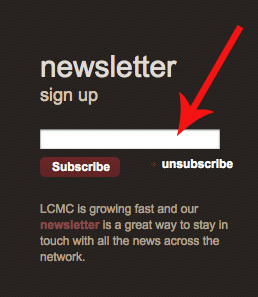 To help make it easier for members of the association to stay up-to-date on current events and announcements from LCMC, we have officially launched our own monthly e-newsletter. Sent via email at the end of each month, the newsletter will feature news and announcements from the association, upcoming events, and more. All who are interested may sign up to receive the newsletter by using the subscribe tool in the bottom left-hand corner of our website's homepage. Simply type your email address into the white box, then click the appropriate button. You may also unsubscribe from the newsletter at any time by clicking on the link at the bottom of the newsletter. BY THE WORD - Our quarterly print newsletter. LCMC Blog - Updated regularly. Facebook & Twitter - For social media fans. LCMC Forum - Connect with others!